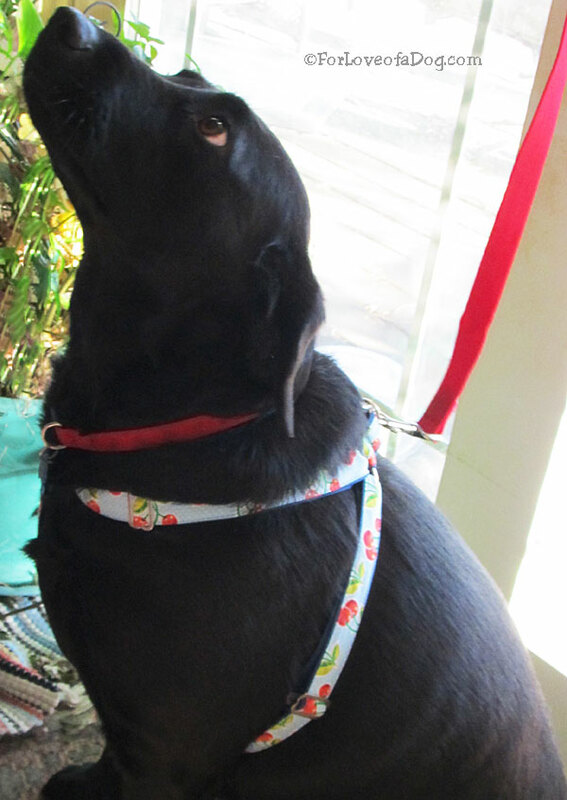 Rosie is looking tres chic in her new harness from The French Dog.. Even a couple of country hick dogs like a little fashion treat from time to time. They may not often go anywhere all that exciting, but Rudy and Rosie are tres chic their new harnesses from The French Dog. As a Valentine treat for myself, I shopped dog collars and harnesses online and couldn't resist these two. They're step-in style, so very easy and fast to put on which is a real plus according to Rudy and Rosie. 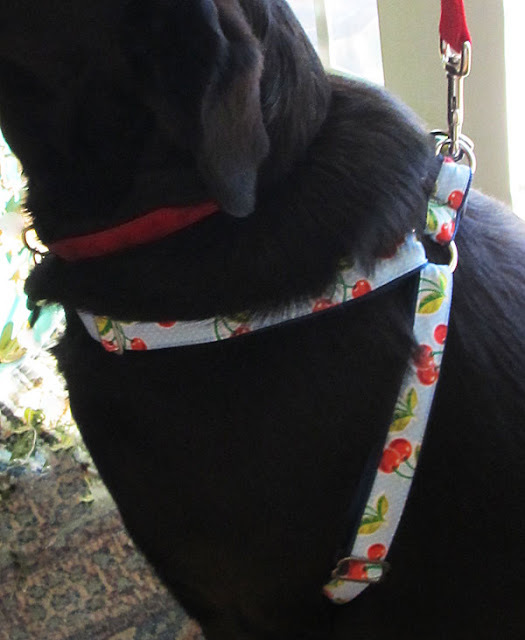 Rosie's new harness is adorable with a scattering of ripe cherries on a blue background. Kinda retro and totally cute! 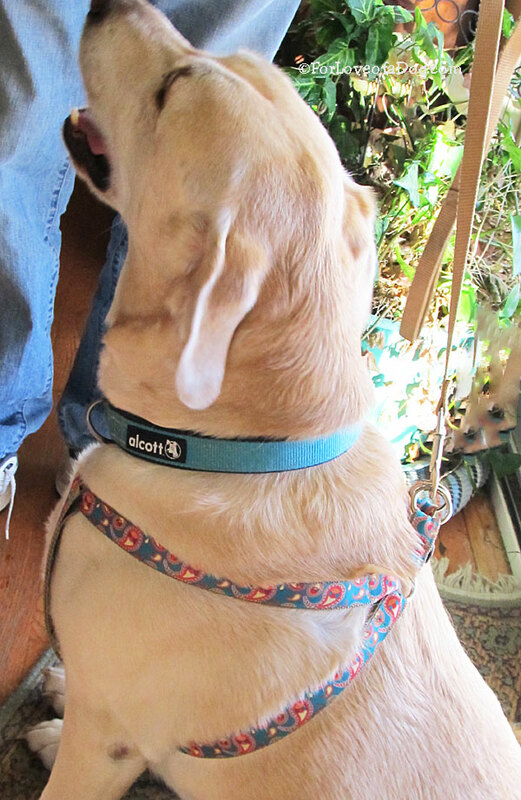 These harnesses are not only well made, they're custom made, so sure to fit. I'm so pleased with the quality and the speedy shipping. They arrived in plenty of time for Valentine's Day. Rudy's custom harness fits his deep chest so well! The French Dog is the passion of Karen Dibert and is named after her own French Bulldog pair, Louie and Jill. 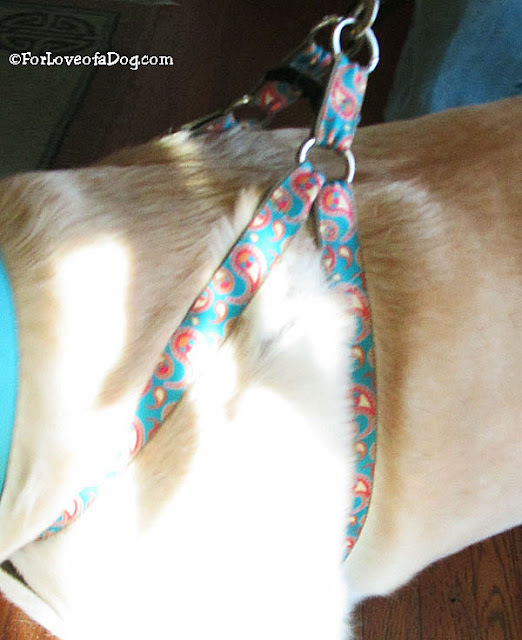 Karen makes handmade collars, harnesses, leashes and dog coats in some very cool patterns and designs. Styles include preppy, nautical, plaid, tie dye and a whole lot more. She also makes some pawsome doggie bow ties and flowers to add to dog collars. Gorgeous teal paisley design looks great against Rudy's furs! I do want to make it clear that I shopped for and purchased these harnesses, so this is not an ad or sponsored review. These harnesses are so beautiful that I just wanted to share The French Dog with you and your pups. Those are beautiful and don't Rudy and Rosie look so stylish! I'm always on the search for functional harnesses, so we never end up with anything stylish...we might have to change that! They are super cute! Love the cherries one! Thise look very nice and y'all look mighty fancy!